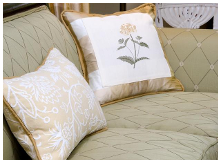 Linda Dickerson Interiors has the exact touches you need to brighten-up your home from floor to ceiling. Great care is taken by our designers in helping you find the exact fabric, wallpaper, rug, lamp, artwork or an accent piece you're wanting. If the timing is not right for a "complete facelift" of a single room or your entire home, we can also rearrange your existing furnishings and thereby redesign the space...perhaps just adding an accessory or two to redefine the overall look. Staging a home prior to selling is another of our creative services...putting your home's "best foot forward" so to speak for optimum real estate activity. And last, but not least, we also offer the option of strictly a design consultation at your home or office. This service is for those people who are seeking creative ideas and solutions but wish to do the leg work and implementation of the job themselves. Whatever your situation, we are here to help. CLICK on Design Studio in the RIGHT COLUMN to find out more about our offerings and the types of products and samples we carry. CLICK on Home Staging in the RIGHT COLUMN to learn more about our different staging services, and how staging can help you when selling your home.